I love shooting weddings in the Hamptons. While I am primarily based in New York with a studio in Brooklyn, I often travel to the Hamptons to shoot weddings. I have photographed weddings in the East End of Long Island, New York, since moving here in 2008. An understanding of the Hamptons wedding locations is crucial to being a Hamptons wedding photographer. Traffic in the Hamptons can be especially difficult during the season, and it's imperative that a Hamptons wedding photographer know how to handle those situations. It also helps if your Hamptons wedding photographer has either a car or access to reliable transportation. It can take quite awhile to drive to the Hamptons, especially in weekend traffic! Since I've photographed many Hamptons weddings, I am very comfortable with the travel to get to the Hamptons even on the busiest of weekends. I have been a destination wedding photographer since beginning my business in 2001. I am very comfortable traveling for weddings, booking my hotel stays, and transporting my team around the country for weddings. 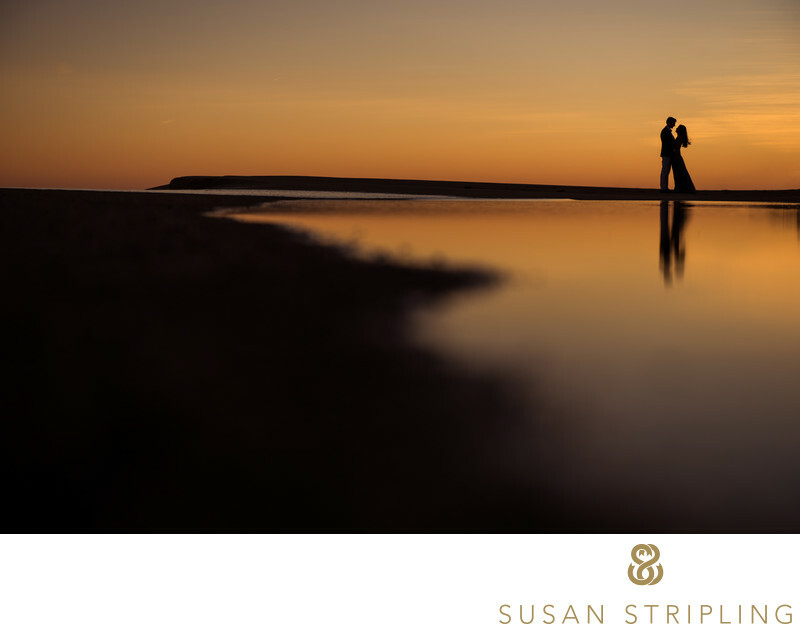 Rest assured that should you commission Susan Stripling Photography for your Hamptons-based wedding, we would arrive on time and well-traveled! We always leave a day to travel to the Hamptons, because travel times can vary. We will book ourselves either a hotel, bed and breakfast, or room in an AirBnB for the night before your event. We will never travel on the day of a wedding, as the travel times are too unpredictable. We will always leave extra time in case of any travel or traffic related issues. 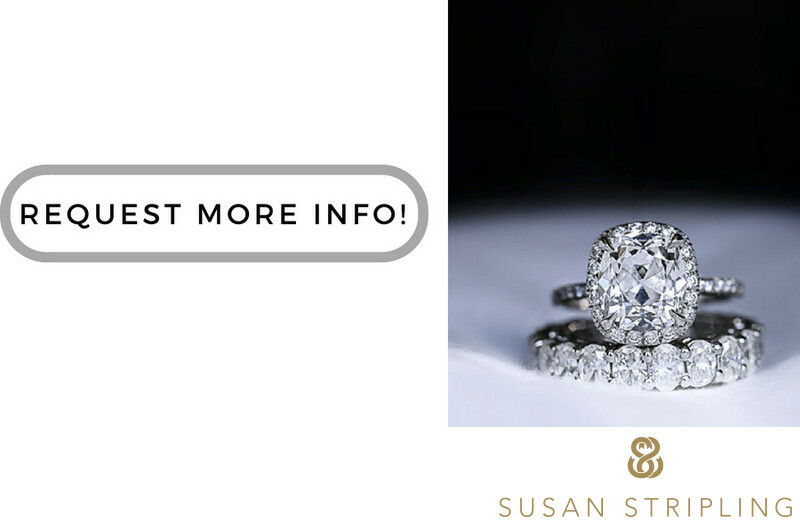 We take our promptness and reliability extremely seriously, and have many safeguards in place when we prepare for traveling to a wedding. It is always a joy to be invited to photograph a wedding at a clients’ private home. I think that having a background for your wedding day pictures that is personal and meaningful to you adds a level of meaning to your wedding pictures! The bride from this wedding had a family home in the Hamptons. The wedding ceremony was held on the beach behind her home. 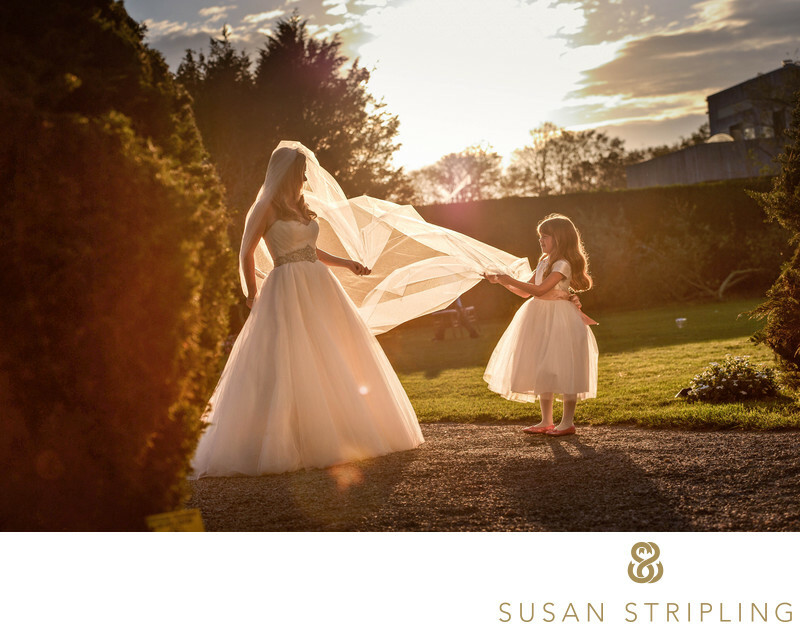 The bride was able to get ready in her family home, which added a sense of comfort and meaning to the preparation images. I can only image that she felt very comfortable getting ready in a home that she knew so well! The tented wedding reception took place on her side lawn and was a wonderfully intimate, joyous party. It was quite a treat to be able to take family portraits in this house, as the background was extremely meaningful to the bride and her family. We were also able to take pictures of the bride and groom together all around the property of the beachfront Hamptons home. Despite the rain on the day of the wedding, the bride and groom were willing to go out under an umbrella for portraits. Now that's dedication! I was so happy when the rain stopped, the clouds parted, and the couple were able to be married on the beach. Beach weddings in the Hamptons are a special kind of magical! Photographing Hamptons weddings in the summer are a great joy since the weather is almost always guaranteed to be gorgeous! While it rained and the sky was grey early in the day, when the bride was ready to walk down the aisle the clouds parted and the sun began to shine. The weather was beautiful during the ceremony and then began raining again, creating a wonderfully cozy feel to their reception. You have to be willing to roll with crazy weather if you choose to get married in the Hamptons. It reminds me of the weather I dealt with as a Florida wedding photographer. Rain would randomly appear and give way to incredible sunsets. Just make sure you have a rain plan for all aspects of your wedding day, and leave nothing to chance! This particular wedding reception took place in a tent erected next to the home. This incredible wedding was also host to some of the most heartfelt, delightful wedding toasts that I have ever witnessed. This photo is of the bride’s father as he toasted his daughter and her new husband. I always love it when parents get up and speak at wedding receptions! 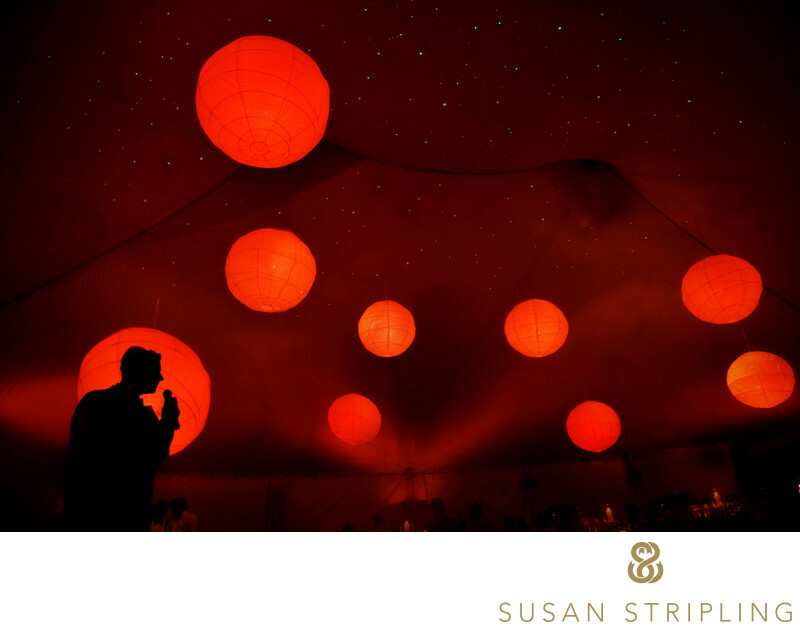 I photographed this picture with a 24mm lens to create a wide scene and really show the entire reception tent. The balls of light were so bright that when I juxtaposed the father of the bride against them I was able to make a perfect silhouette of his head against the lantern. I made sure that I was angled perfectly to place his face precisely in the middle of the paper light. I love this image in the clients' gallery alongside all the rest of the toasting images, as it really enriches the entire gallery. There are absolutely images where you can see her father's face, well-lit and clearly visible. Having this image alongside those images just helps tell the story of the day in a clearer, more illustrated manner. This is one of my favorite images that I photographed in 2009. It was an overwhelming honor to have it win the 16x20 International Print Competition Wedding Photojournalism category at WPPI. The picture also went on to win the Grand Award in Photojournalism, one of only a handful of Grand Awards given out at the competition. Being awarded by my peers in such a prestigious competition was incredible and continues to inspire me to create memorable, compelling images for my clients and their families. This remains one of my highest scoring images in print competition. It also remains one of my favorite images I've ever photographed at a wedding. I feel that it truly embodies my style in a very memorable way. The image is theatrical. It tells a clear story. It has a sense of drama. It has a striking composition to the frame. Looking at the image, you can really feel what it was like to be in that tent, on that day, at that particular wedding! In 2009, my then-boyfriend won the Grand Award for Photojournalism, and I remember watching him give his acceptance speech at the awards ceremony, thinking "I have so much to learn and so far to go. "I vowed to double down and keep pushing myself, and promised that one day I would be up on that podium. It happened for me in 2010, with this image from 2009. This image has long been a favorite of mine, but it really represents a turning point in my photography skills. I was at a wedding (a gorgeous, gorgeous wedding for gorgeous, wonderful people), and the bride's father was giving a toast. It was on the longer side, and eventually I motioned to my assistant to put down the flash and wait a bit. I crouched down on the side of the dance floor - and to this day, I can't remember why. Was it to look at my phone, briefly? Was it to change a CF card? Tie my shoe? I can't remember. But I *do* remember looking up and seeing the father of the bride silhouetted in the hanging lanterns. I remember thinking "I am seeing something here." It was a lightning bolt to the brain : images are everywhere. Sometimes they are powerful, sometimes they are lame, but there are images to be found EVERYWHERE. Without thinking about skills, without debating settings, I found my hands moving over my camera, adjusting exposure compensation and zooming out my lens. I lifted my camera to my eye, and there it was. Why is this important?It's because I didn't have to think about the picture I was making - I just MADE IT. I instinctively knew my settings.I instinctively knew what focal length I wanted. It might have taken eight years, but I was finally REALLY SHOOTING. The image, straight out of camera, looks almost precisely like this. This is especially important in the Photojournlism category, when you're ONLY allowed to do what you could do in a darkroom - dodge, burn, crop. You cannot manipulate. The image matters. This image scored a 97, meaning that it was in the 95-99 range, "superior...approaching the highest standard in imagination, creativity and technique." It won first place in the Wedding Photojournalism category, and went on to take the Grand Award in the Photojournalism category. Location: 840 Meadow Lane, .Southampton, NY 11968. Keywords: Hamptons (69), wppi (54). 1/50; f/3.5; ISO 1000; 24.0 mm.